College football is right around the corner. If you are tailgating in the big U, show your spirit. 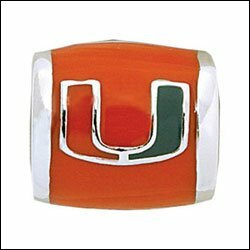 These Miami Hurricane Pandora bracelet charms are the ultimate form of fan expression. So get one of them for your bracelet or get ALL of them for your bracelet. Get a new bracelet JUST for all your new Miami Hurricanes Charms. This school competes in so many different athletic activities from NCAA basketball and BCS football to tennis and soccer. No matter what your sport is, if you are a fan then this collection of charms is just what you need. 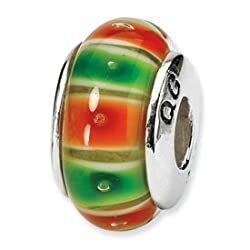 This Hurricane Pandora charm is Orange on one side and Green on the other so you get your school colors out there. 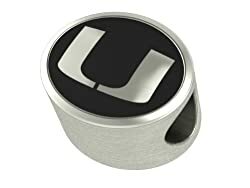 The image at the top of the page is the reverse side of this Miami U Pandora charm. This is the full color vibrant way to say that you are a fan. 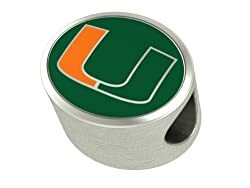 If you plan on building an entire bracelet that is themed about the U, this is the first charm you need. The bold bright color lets them know you are a fan from a a long way away. Sterling silver hurricanes Pandora bracelet charm that dangles. U Miami on one side and the U on the other. This is the idea charm to represent your orange and green. Tell the world who you represent. These charms are classy and stylish AND support your team. Best of both worlds. Bright orange and Green U for all you Cane fans! This charms is tube shaped so it slides right on. It will spin on your bracelet so it won’t catch on anything. Perfect charm. Full color with on top of sterling silver, this is a piece of jewelry, not costume jewelry. This has the full school logo on the charm. Whether you follow football, NCAA basketball or any other sport that this school competes in, this is a fans charm and a must have for any U fan. Let those Hurricane colors SHOW! You want to represent the U but the logo is a bit much? 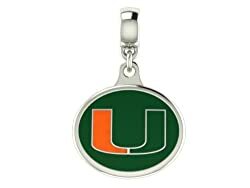 This is a way to show your colors without all the bling, or a perfect addition to your Miami Hurricanes charms. Putting together this collection I ran across this bead and is screamed Hurricanes! I had to add it. If you are making a bracelet dedicated to your school, this is the perfect filler. I can see 2 or 3 of these on a bracelet with the charms above. What an amazing piece that would be.